It looks like we may have a preseason named storm before too long. The NHC has increased the chances of development for what is now invest area 90L, just off the east coast of Florida. 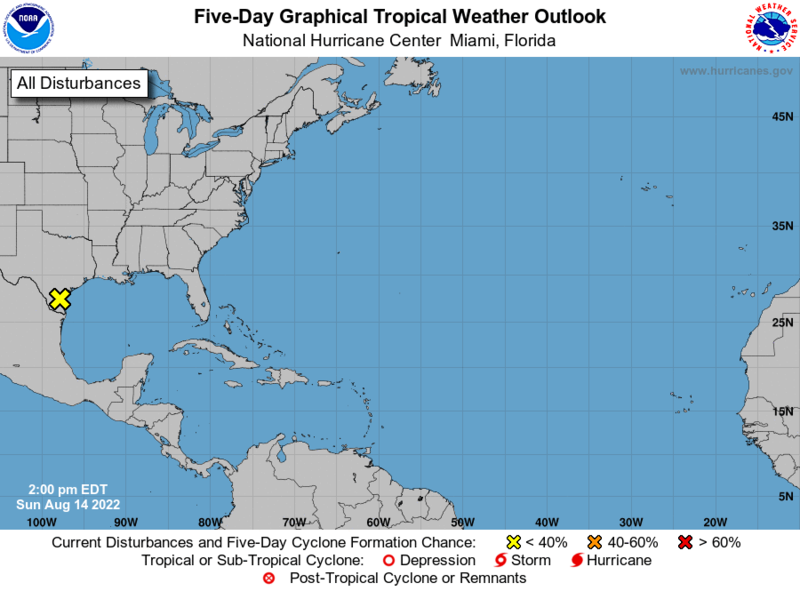 As of this morning, the odds were placed at 60% for either a subtropical or purely tropical storm to form over the next 48 hours or so. As you can see from the satellite picture, the low pressure area is beginning to organize but it still has that spread out, subtropical look to it. This is common when seeing systems develop from non-tropical origins, especially this early in the (almost) season. It is interesting to note that some of the computer models do suggest a quick transition in to a purely warm-core, tropical storm before it impacts the coast Friday or Saturday. Water temps are only just warm enough to support such a scenario but we have seen instances when storms have ramped up despite having less-than-ideal conditions to work with. All that being said, it’s not the heart of the hurricane season and as such, we do not need to be concerned with a high-impact event. However, that is not saying that we need to downplay the impacts and ignore what ever forms off the coast. At the beach, an increase in surf and associated rip-currents will be an issue from parts of Florida up through the mid-Atlantic. Check your local NWS site for more information specific to your area. Breezy conditions are likely (winds are already picking up now here in Wilmington, NC where my office is) as the low takes shape and moves slowly northward. I suppose that there is at least a chance for tropical storm conditions in parts of the Carolinas along the immediate coast as we end the week. A lot will depend, obviously, on how well organized the storm becomes while over the warm water of the Gulf Stream. The other impact will be rain, sometimes heavy as bands move onshore. This is likely to be more of a nuisance than a true flood threat. Any outdoor plans Friday and Saturday should take this in to consideration. We’re looking at a few inches of rain at the most since the system is likely to be rather shallow in terms of deep thunderstorm activity. This should help to keep the rain from being too heavy over a wide area. The Hurricane Hunters will eventually investigate the area and we will know more about its structure and intensity at that point. This probably won’t be until tomorrow. Kind of ironic that they are touring in Myrtle Beach right now as part of the NHC’s East Coast Hurricane Awareness Tour. Timing could not be better, eh? I’ll have more here tonight with a brief update. I’ll also post a video blog to our app, Hurricane Impact. If you haven’t opened it in a while, now is a good time. Check the video section later today, I will have the discussion posted by 1pm ET. The Hurricane Hunters have been investigating 98L this afternoon and the NHC subsequently issued a lengthy bulletin a little while ago. The info from the NHC tells us that there is not quite a well defined low level center associated with 98L just yet. However, it may be only a matter of hours now until that happens and the system is upgraded directly to tropical storm status (Rafael). Regardless of the naming, the bottom line is that the region around the Lesser Antilles is experiencing squalls with some winds gusting over tropical storm force. These conditions will persist over the next day or so as the low pressure area moves northwestward. There really isn’t much change in the overall track or intensity model guidance this evening. I think once we get a true center to form and the computer models can take this information and run with it, that we’ll get a clearer picture of the impacts for the Leeward Islands and possibly Bermuda. I’ll post another update here around 11pm ET tonight with the latest on 98L.